Ascendant Access have recently delivered two more of their 18m telescopic-plus-jib A18-13TJ platforms mounted on the go-anywhere Takeuchi TCR50 tracked carrier. This machine, nicknamed “Swampmaster” is the ideal solution for inaccessible locations experienced in overhead line installation and maintenance and line-of-site surveying applications. Weighing just 5.5t tonnes and with a total ground contact area of 2.25 square metres, the bearing pressure during travel is extremely low to cope with soft ground conditions. The operator is well catered for with a fully enclosed, heated ROPS/FOPS cab – ideal for working in cold, remote locations after storm damage!. The powerful Takeuchi chassis has a travel speed of 9km/h with 30% gradeability and the unit can be levelled with hydraulic outriggers on a 20 degree transverse slope. 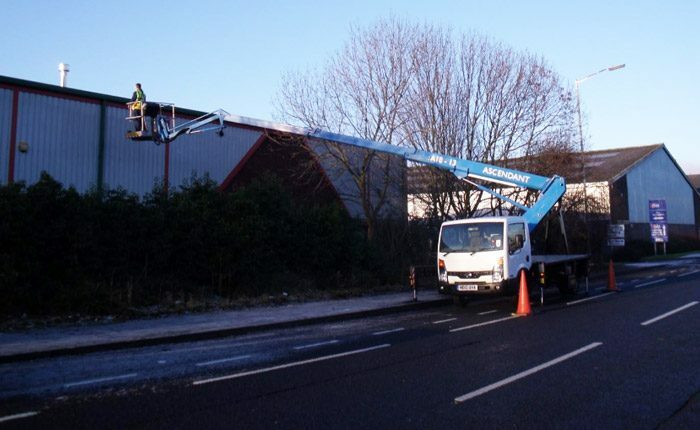 The platform reaches 18m working height and has a huge sideways reach of up to 13m and the easy to position telescopic boom has a versatile 125 degree jib. The standard tubular cage has powered rotation and a 230kg SWL, plenty for two operators and tools. The A18-13TJ is a standard production unit with full pressure hydraulic controls for reliability in tough conditions and ease of maintenance. For such a high performance machine the Ascendant/Takeuchi combination is very affordable and practical to own.